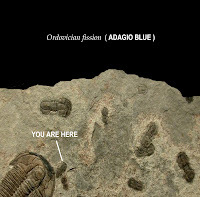 Atlas and the Anchor: Adagio Blue - "Ordovician Fission"
Adagio Blue - "Ordovician Fission"
"Ordovician Fission", the debut studio release from Adagio Blue will be released by Alpha Dawg Records on October 25th. Adagio Blue is a post- modern instrumental, melodic jazz-funk fusion band from Ohio; the brainchild and side project of guitarist/songwriter Jay Brunner (of Johnny B and the Gravediggers) and bassist/songwriter Chris Rhoton with Matt Hall (keyboards) and Mark Becknell (drums). All of the songs were recorded in a live band setting with no overdubs. Most songs were recorded in just one or two takes, which is a testament to the experience and talent these four members exude. They have more chops than a butcher shop! Comparable to the avant-garde jazz of Medeski, Martin & Wood, the retro funk of Lettuce and Soulive, with touches of prog-rock and blues, Adagio Blue blur the lines of classification. "Second Of Six" starts out with a dueling guitar and bass race before giving way to a walking bass line and noodling guitar riff that should make every jam band envious. "Laurentian Kid" is an organ drenched blues rock rave-up with funky slap bass and a stop/start rhythm. The title track, "Ordovician Fission" incorporates twinkling keys with a Primus-like guitar line into a dissonant distorted jazz freak out. Adagio Blue will be playing a CD release show at the BBQ Connection in Middletown, OH on Saturday, October 25th. Don't miss their skilled, improvisational live show! Copeland - "You Are My Sunshine"
only makebelieve - "Message From A Mockingbird"
TV On The Radio - "Dear Science"